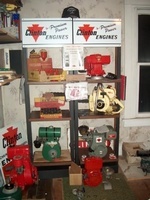 In 1950, Don Thomas moved his Clinton Machine Company from Clinton, Michigan to Maquoketa, Iowa where they quickly became a world leader in small engine manufacture. The 12 acre site yielded over 18 million engines, making the company the 10th largest employer in Iowa, drawing workers from over 33 different communities in three states. It was the first time that farmers here worked in a factory, farming around their shift, thus changing the socio-economic status of the entire area. 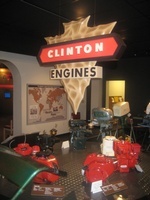 Clinton Engines were used around the world on many hundreds of different machines. They were extremely innovative, many of their ideas becoming industry standards. The Administration Building, on the National Register of Historic Places, is the only building still standing and is now the home of the Clinton Engines Museum, and one of Iowa’s Greats Places. 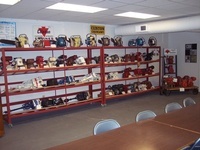 The Clinton Engines Museum is also home to the Jackson County Research & Family History Library (home of the Genies), the JCHS Media Arts Center, and the Clinton Engines Association. The large Program Center in the lower level is the site of many JCHS functions and available for rent for community activities, private parties, meetings and banquets.